In this context, a ”strategy” is a logically consistent set of individual actions combined to create a comprehensive policy response. Usually there are several categories of possible management actions, and creating a strategy involves selecting one or more actions from each category and combining them to create a comprehensive strategy, normally with a recognizable theme or approach. 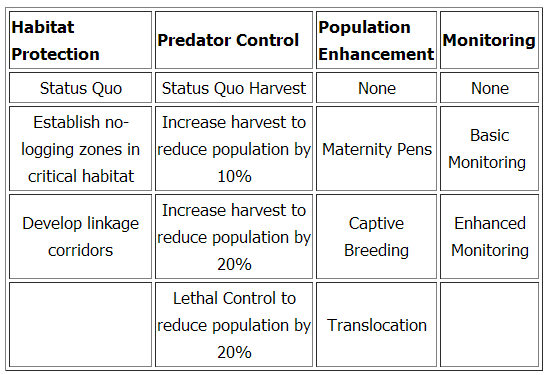 A strategy table is a logical and convenient way of describing the definition of alternatives in terms of specific selections made from various categories of actions. Now there are a multitude of possible combinations, but not all of them logically go together, or alternatively, some may need to be done in concert. 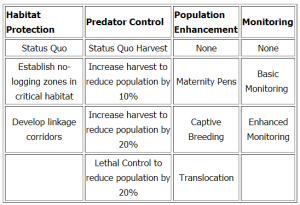 In the above case for example, translocating animals without concurrent predator control would not likely be considered. Depending on the decision context, it is usually useful to define 2-8 logical combinations or strategies. These strategies provide a good starting point. Subsequent modeling should facilitate a helpful learning process from both a technical basis (what would better achieve the objectives) and a value-basis (which solutions offer the most desirable balance of outcomes).